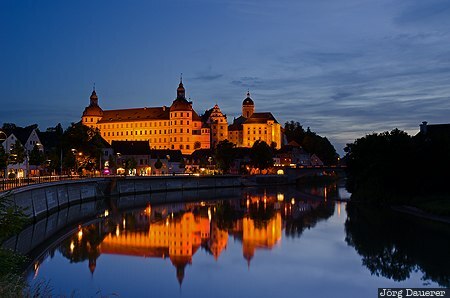 The flood-lit Renaissance Palace (Residenzschloss) of Neuburg an der Donau and its reflexions in the calm Danube river at the blue hour just after sunset. Neuburg an der Donau is in Upper Bavaria (Oberbayern) in the south of Bavaria, Germany. This photo was taken in the evening of a sunny day in June of 2014. This photo was taken with a digital camera.